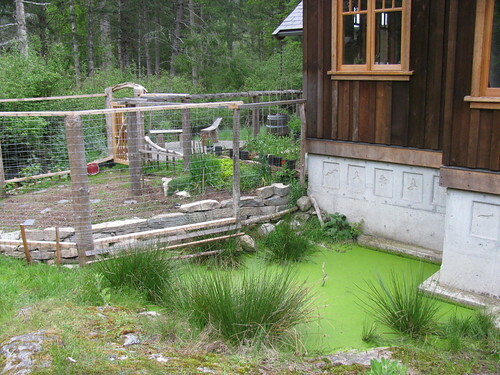 A fantastic house on Saltspring – made and recycled of local materials found within 100 miles. Yesterday I was at Saltspring Island for a board meeting of The Land Conservancy of BC. We held the meeting in the home of Briony Penn, a founding director of TLC, and the current vice-chair. She showed her this Globe & Mail article of her home. Where do you get ultra-local building materials? Briony told us this great story about how she found the sink… just a few days before the building inspectors came to see the house. It was found in the yard of a friend, thus reducing the cost of ordering a sink or purchasing it off-island. And it was free! 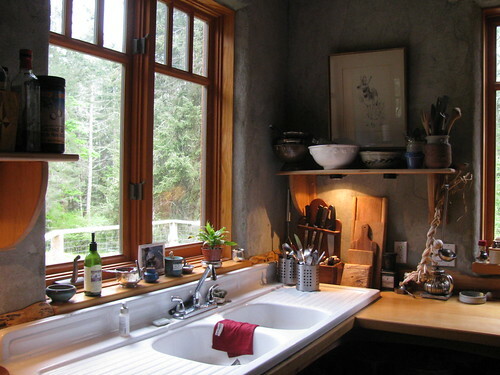 This is a nice kitchen to work in with lots of counter space and natural light. 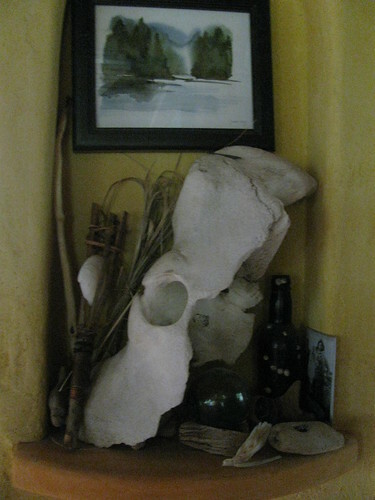 There are lots of personal touches that befit the house of a naturalist. This is a whale spine bone about two feet in diameter… arranged with a Japanese glass float ball that washed across the Pacific Ocean, and other beach findings. Remember that kitchen sink? Well, the grey water from the sink goes through a holding tank and filter, then later finds its way into this pool, which is a habitat for local frogs. The garden behind it is enclosed by an eight foot high fence to protect from deer, then later the garden’s produce finds its way into the kitchen for daily meals. 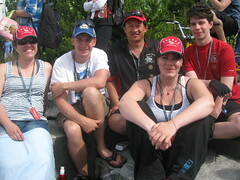 This entry was posted in Uncategorized, Vancouver Area Adventures on April 29, 2012 by admin. Our practices are Sundays 11am – 1pm, and Wednesdays 6pm to 7:30pm. 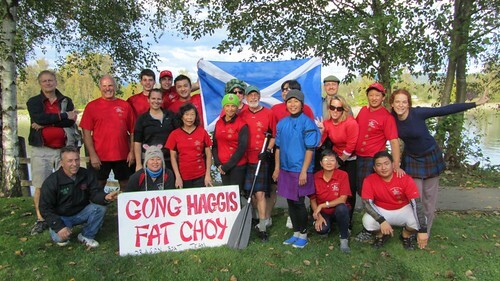 2012 is our teams’ 15th anniversary since starting as Celebration Team, and the 10th anniversary after being renamed Gung Haggis Fat Choy dragon boat team. Over the years, we have won dragon boat race medals in Vancouver, Vernon, Victoria, Richmond, Seattle, Portland, and Bamff. We have also won the Hon. David Lam Award for being the team that best represents the spirit of multiculturalism at Vancouver’s Alcan Dragon Boat Festival, and also the Community Spirit Award at the Lotus Sports Club regatta in Burnaby. Xavier’s first day of steering a dragon boat. He looks great in his kilt. Xavier has worn a kilt to every practice since he joined our team last year. He brings a lot of character to our team, and is now our team’s new kiltmaker. Xavier also brings musical skills to the team. He plays guitar and sings. I invited him to join the Black Bear Rebels, a celtic ceilidh group I play accordion with. 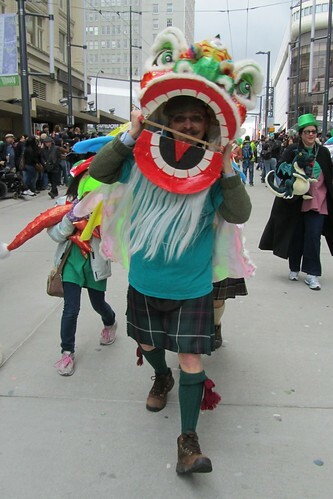 It is led by my bagpiper friend Allan McMordie who has performed at the Gung Haggis Fat Choy Robbie Burns Chinese New Year Dinners for the past few years. A few months ago, the Black Bear Rebels performed at the Dr. Sun Yat Sen Classical Chinese Gardens for both the Winter Solstice Secret Lantern Festival, and the Chinese Lunar New Year celebrations. – photo Dave Samis. 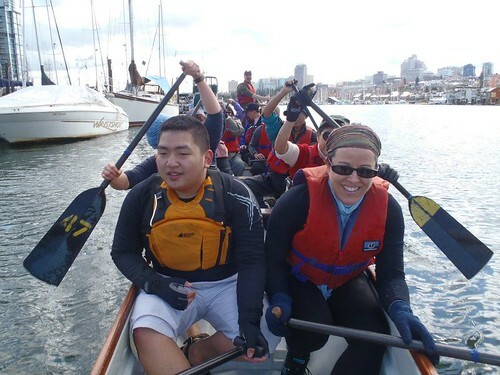 This entry was posted in Dragon Boat Information, Dragon boat with Todd Wong - Dragon Boat Coach, Gung Haggis dragon boat team information, Uncategorized, Vancouver Area Adventures on April 18, 2012 by admin. 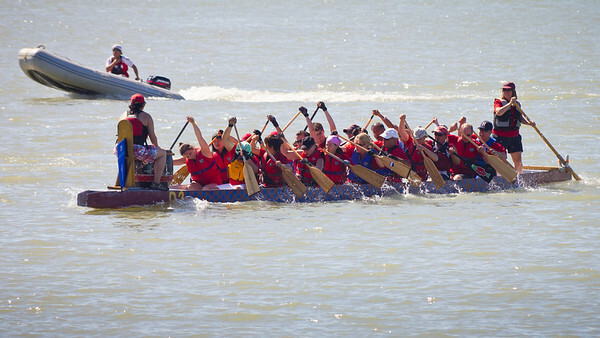 Gung Haggis paddlers paddle neck and neck against each other in the Ft. Langley Cranberry Festival Canoe Regatta on Oct 8th 2011. Both teams are battling for 3rd place in the B Division Final, trying to pull ahead of each other for bragging rights over each other. Both teams finished in the top half of 24 teams, finishing 11th and 12th overall. The Gung Haggis Flying Cranberries on the left had 4 rookies and and was anchored by seasoned paddling friends from the Eye of the Dragon team. The Gung Haggis Firey Chili boat on the right had some of our more experienced paddlers with 2 rookies, combined with experienced paddling friends. It was an exciting race final that celebrated the friendship of beginner and veteran paddlers, helping and supporting each other, in one of our favorite races of the year. 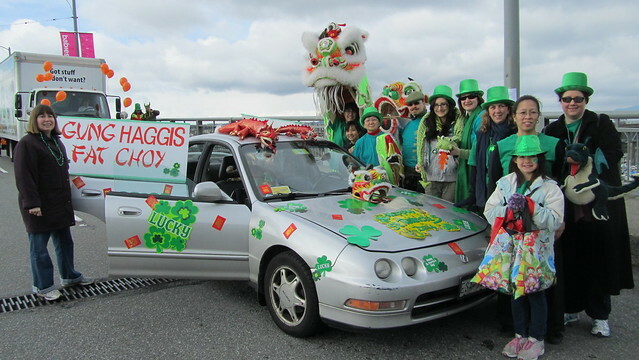 I am very proud and happy with the Gung Haggis Fat Choy dragon boat team. It has been 10 years since the inception of the team in 2002. 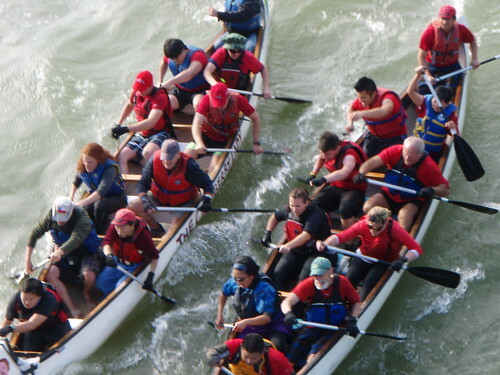 Back then we only did two races a year, the Alcan Dragon Boat Festival and its regatta two weeks preceding. The team had initially begun as the Celebration Team in 1997 which I had also founded and coached, and was renamed in 2002 because: 1) to give the team a new bring more sense of identity with multiculturalism and 2) bring more recognition to the fledgling Gung Haggis Fat Choy Robbie Burns Chinese New Year Dinner. 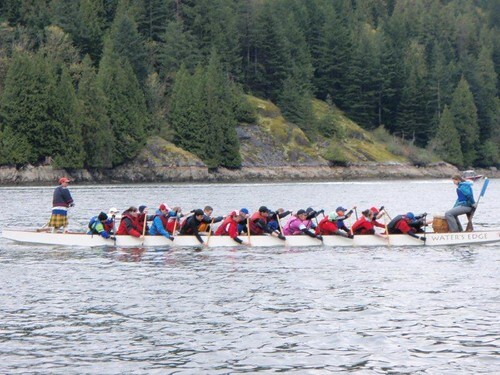 The Gung Haggis Fat Choy dragon boat team finished the last paddling event of the year last week with a paddle down Harrison River from Harrison Hot Springs. 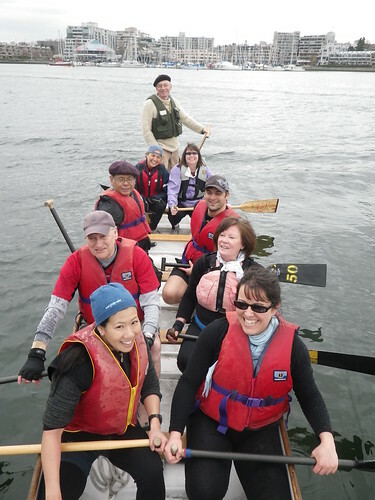 We paddled on Burrard Inlet for the Lotus Club regatta. It is a tradition for us to start our season by racing in May at the Barnet Marine Park. My first-ever dragon boat practice in 1993, was here at the Lotus Club as a spare paddler for the Headliners dragon boat team. I am always glad to support the Lotus Club, and we have many friends at Lotus. 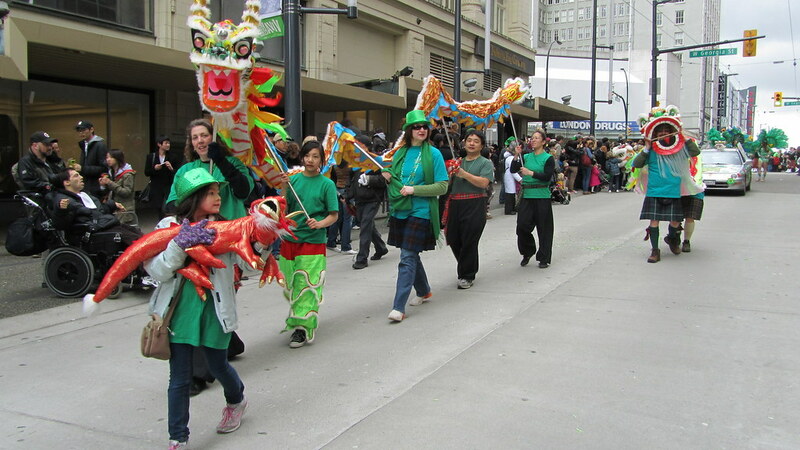 Too bad, the weather was so wet and rainy that we could not bring out our Chinese dragon and lion for ceremonial dances. 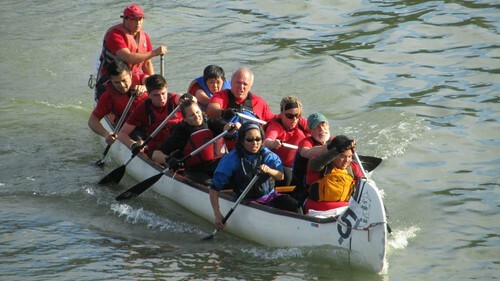 Debbie (black shirt and red tartan head band) leads warm-up at the big Rio TintoAlcan drago boat festival in Jun. 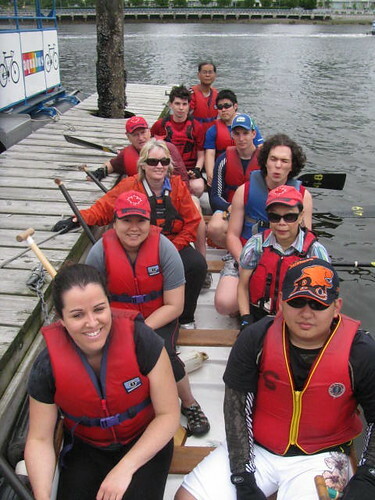 Debbie started as one of our youngest paddlers, and is now an assistant coach and team leader. We raced in the Rec E Final for medals, and came a very close 4th – just missing a medal by split seconds. We had 3 paddlers from France on our team: Anne, Leo and Alice. Beside me in a red team shirt is Aidan, this season's rookie of the year – male. just East of Steveston Village. After 3 races, we came 3rd in the C Division Consolation. 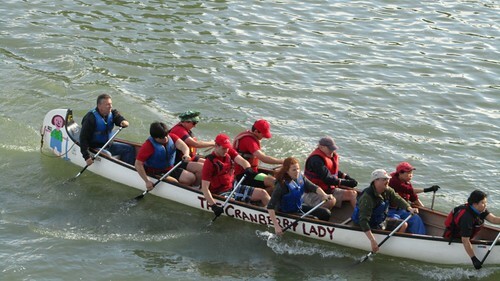 We always enter two teams at the Ft. Langley Canoe Regatta for Cranberry Festival. 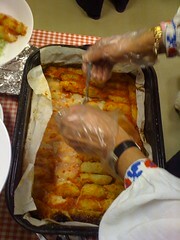 Gung Haggis Fiery Chilis had some of our veteran paddlers and paddling friends. Steered by Todd Wong (myself), and captained by lead stroke Karl Castillo. 2nd seat is Michelle and Dave, 3rd seat is Carly and Tracey (both from Flight Centre team), 4th seat is Aidan and Steve, 5th seat is Remus and Caroline. Gung Haggis Flying Cranberries was steered by steered by our friend Harvey, and anchored by Johnny and Maggie in seat 5 – all from the Eye of the Dragon team. It was captained by lead stroke Debbie. 2nd seat is Xavier and Keng, 3rd seat is Sara and Gerard (in Sara's first race), 4th seat is Leo and Christian (both promising rookies). 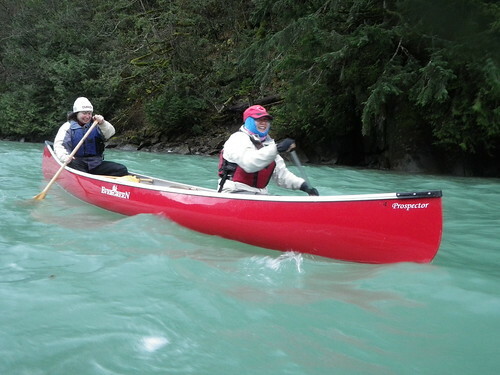 Deb and Debbie had big smiles, as the paddled down the Harrison River on Nov 27th, Grey Cup Sunday. It was our last official paddling event of the season. Last year, some of our paddlers joined me on some of the final days of the 5 day “Paddle for Wild Salmon” from Hope to Vancouver. We wanted to recognize the salmon migrations on the Harrison River, and the bald eagles that feed on them. Our idea was to paddle and drift pass the eagles feeding on the spawned out salmon – but we ran into a strong headwind that slowed down our travel speed. After paddling almost 4 km, we turned back to the Harrison Lake. “A grand failure” was what rookie paddler Xavier called it, while we ate dinner in Agassiz while watching the 2nd half of the Grey Cup Football Game. 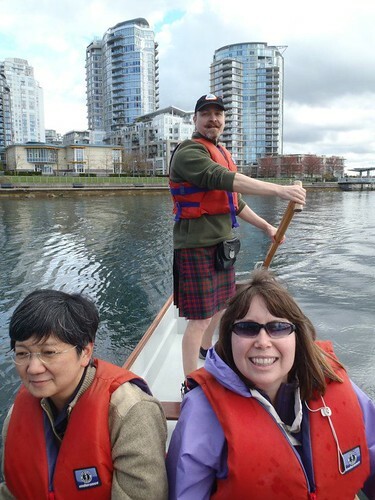 This entry was posted in Dragon Boat photos 2003, Dragon boat with Todd Wong - Dragon Boat Coach, Gung Haggis dragon boat team information, Main Page, Vancouver Area Adventures on December 3, 2011 by Todd. 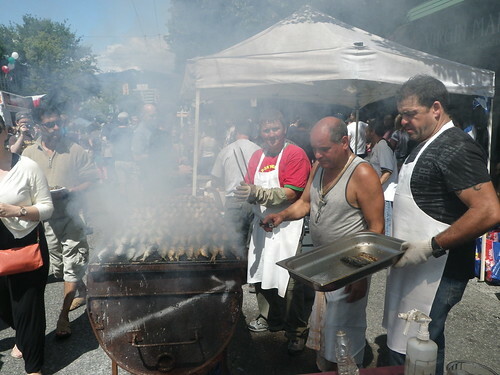 Ukranian Hall, 805 East Pender St.
First Nations, Chinese, Hawaiian, Ukranian, and British ethnicities and cultures mix together at Heart of the City Festival. David Nahanee's First Nations family gave the opening welcome and drumming to open the festival. Savannah Walling and Terry Hunter (back row) are the festival's founders and artistic directors. 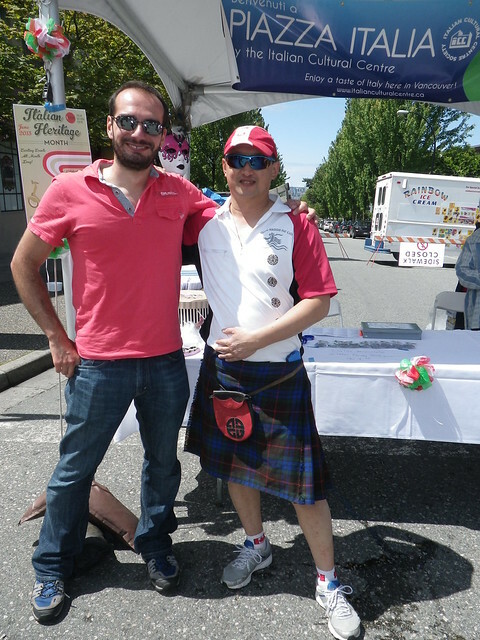 Todd Wong (right) was guest accordionist. William Nahanee explained to me that his family name is of Hawaiian origin, as Hawaiians had come to BC with traders, and settled into the Squamish Nation. It is now a common name, he explained to me when I told him I had a friend named Nahanee in grade 8. I played solo accordion in the second half of the program. I started out with the Chinese folk song Mo Li Hua (Jasmine Flower), then a version of Scotland the Brave. Terry Hunter had give me an introduction to the audience mentioning how I am the creator of the Gung Haggis Fat Choy Robbie Burns Chinese New Year Dinner, so I explained that I wanted to acknowledge that Chinese and Scottish pioneers were the founding pioneer cultures of British Columbia – not English and French as in Eastern Canada. I explained that my great great grandfather had come to Canada and ministered at the Chinese United Church, just up Pender St. 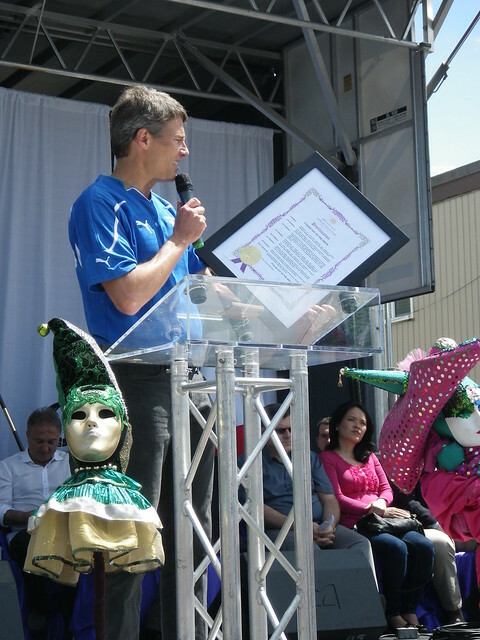 It has been a pleasure to participate in the Heart of the City Festival, and I wanted to acknowledge the immigrant groups that have settled in Strathcona and the Downtown Eastside. The next songs I played were J.S. Bach's Toccata in D Minor and the St. Louis Blues, to acknowledge German and American pioneers to Vancouver, and especially Jelly Roll Morton who had lived at the Patricia Hotel over on Hastings St. 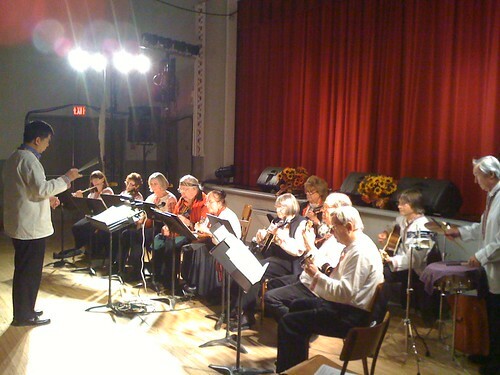 The Ukranian Folk Orchestra played a number of songs for the concert. Conducted by David Ho, who is Chinese, most of the members are of Ukranian ancestry, and all share an appreciation for Ukranian folk music. Instruments included flute, violin, lute, mandolin, guitar, drum & percussion. Sadly, they no longer have an accordion player, which prompted one of the band members asked me to join them. 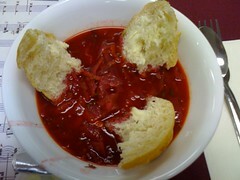 Bortsch soup, made from beets – a Ukranian staple, that I first had many many years ago made by a high school friend. 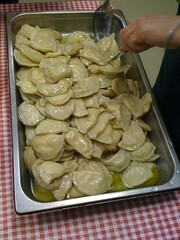 No Ukranian dinner would be complete without perogies. One of my favorite foods I like to keep stored in the freezer, and smother them with cream cheese. 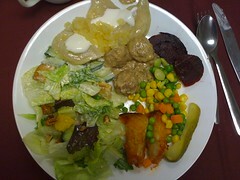 Here is the completed dinner with salad, meat balls, beets, cucumbers, cabbage rolls and perogies! This entry was posted in Food & Restaurants, Main Page, Multicultural events, Vancouver Area Adventures, Vancouver Heritage and History on November 8, 2011 by Todd. It had been about 15 years since I last visited Hornby Island. I had talked with my girlfriend Deb for years about going to visit my cousins who have lived there since the mid 1970's. My first visit to Hornby was around 1970 on a family trip. I remember swimming and my father creating rafts for my brother and I to paddle on in Tribune Bay. I had many trips in the late 1980's and 1990's. I watched my cousin's children grow up, and now they have left the island and live out of province. Hornby definitely has a laid back feel, and you can almost feel transported back into the communal hippie love vibe of the late 60's and early 70's. We visited the Co-Op store and the ring of little shops next door to it – that constitute the “downtown” business centre of Hornby Island. We also visited the Community Hall where a Fall arts and market fair was happening. Thanksgiving Dinner was on Sunday at my cousin's home. They had invited some of their friends, and slowly I realized how I had met some of them 15 years before. After the dinner, I played my accordion – like I had done many years ago at Thanksgiving dinners on Hornby. My cousin Wayne also played some flamenco on his guitar. Also attending the dinner was their artist friend Wayne Ngan who specializes in pottery and painting. 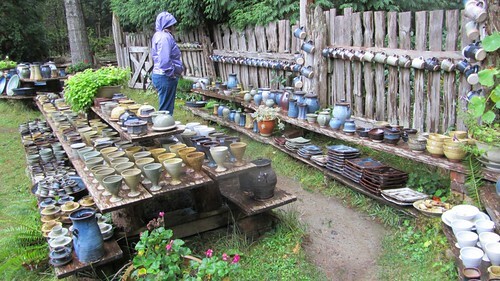 We went to visit Ngan's studio the next day where I bought a small pot. This is a picture at the pottery studio of Heinz and Gerhard. Past visits in the 80's and 90's always found me selecting plates, cups or bowls. This visit selected the large blue vase that can be seen in the bottom left corner of the photo. On our 2nd day, we drove out to Ford's Cove and visited the marina where all the fishing boats are docked. It was almost so cloudy and misty that you couldn't see nearby Denman Island. The store is very small but not unlike a lot of marina stores up and down the coast. It has a little bit of everything and especially a large dvd rental collection. I had an Americano coffee as my cousin had told me they had good coffee. In the afternoon we walked out to the bluffs at Helliwell Park. This is an amazing park with a fragile ecosystem along the bluffs. There are also lots of sandstone sculpted rocks along the shoreline. But it was very windy, and we were careful not to get blown about. It's a very steep drop off the bluffs. We didn't have enough time to walk the entire loop trail, as we went to visit another friend of my cousin's whom I had also met 15 years ago. She is now housebound due to old age, and I was asked to play my accordion for her. It was a great visit of sharing stories and playing music. 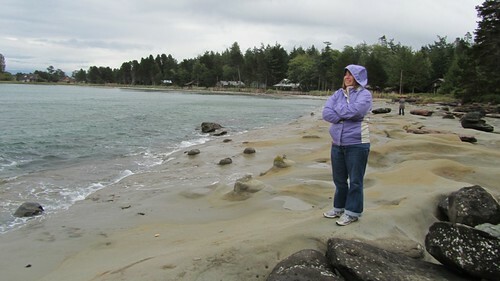 Deb stands on Whaling Station Bay – the tide was coming in. We went back on the next morning and saw the wide expanse of beach at the shallow bay. It's a great place to swim in the summer because the shallow bay keeps the water quite warm. I have promised Deb that we will return when it is warmer – maybe a Long weekend visit in May sometime in the future? 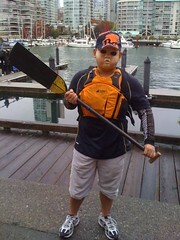 This entry was posted in Main Page, Todd Wong, Travel reports, Vancouver Area Adventures on October 17, 2011 by Todd. Word On The Street – is almost swept up by the wind, but prevails! Adrianne Carr, Green Party politician, came by the Historic Joy Kogawa House booth, and told me that her daughter had shared with her Joy's children's book “Naomi's Tree.” “It's a great book” said Carr, as we chatted about the importance of saving historically significant landmarks (such as Kogawa House), and conserving sensitive and important environments – okay, I told her I was a director for The Land Conservancy of BC. It's always great to see literary friends such as Evelyn Lau, George McWhirter, Renee Saklikar, Brad Cran, Charles Demers, Wayde Compton, Marisa Alps, Kevin Chong, Ariadne Sawyer, Alejandro Mujica + more… Lots of great books and magazines! I did my Christmas shopping to support local book publishers! 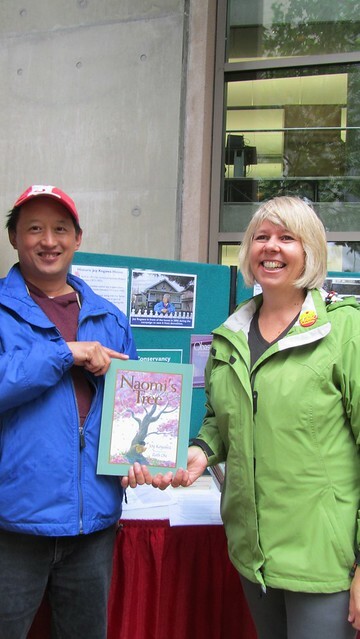 Also great to see my friends at the booths such as Historic Joy Kogawa House, Ricepaper Magazine, Chinese Canadian Historical Society of BC, CUPE BC, Tradewind Books, Harbour Publishing, Vancouver Review, BC Book Prizes, VPL Foundation + more! 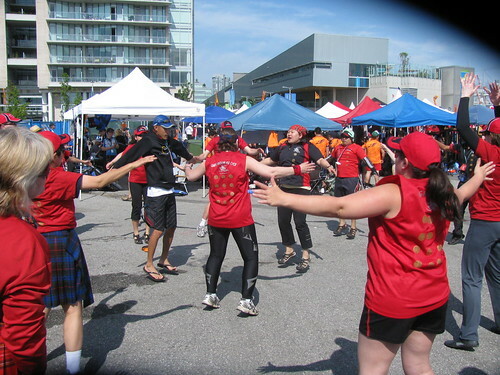 It was a busy busy Sunday, starting at 10am, because we had moved the dragon boat practice for Gung Haggis Fat Choy dragon boat team one hour early to encourage paddlers to attend events at WOTS. Deb & I arrived shortly around 1pm to see that the tents for Poetry and Childrens events were flat on the ground. We later learned that the wind tunnel on Hamilton St had threatened to lift the tents into the air. After past years of rain, road closures, and a library strike, this will be forever known as the Year of the Wind. Storytelling in Word in the Street tent. Wind blew. Wind blew and blew; tent flew up; chairs fell down; Persian carpet went into orbit, as per its history. George McWhirters steps off the “Poetry In Transit” bus, where Poetry Tent events were moved to after the tents were “put down” for safety. George told me that he had arrived at the Poetry Tent 10 minutes before his scheduled event to find the tents flat on the ground! 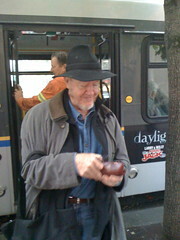 Rob Taylor read his poems on the “Poetry In Transit” bus, which didn't have any lights because of a dead battery. Transit attendants had to herkily-jerkily back up the bus while previously reading poets and host Evelyn Lau were still on the bus chatting with audience. Christine Lowther reads her poems – not on the bus, but in the outdoors – from her collection “My Nature” at another location instead of the Poetry Tent. Despite the early morning rain, and the sudden windstorm, this year was lots of fun. Great programming at WOTS this year. I was able to help out at the booth for Historic Joy Kogawa House, check in at Ricepaper Magazine, drop in at lots of author readings, chat with friends at the publisher tents, and buy lots of books, as well as scoop up some deals at the silent auction prizes. I was able to see Jen Sookfong Lee, Wayde Compton, Susan Crean, and many other authors. The elegant Jen Sookfong Lee read from her new book “The Better Mother” and also suggested to aspiring writers to never give in to Writers Block, nor interrupt their writing time. She admitted that she doesn't answer the phone even when she knows her mother is calling. Wayde Compton is the current writer-in-residence at Vancouver Public Library. He spun a particularly captivating story about mixed races. But I know because I read an advance copy! 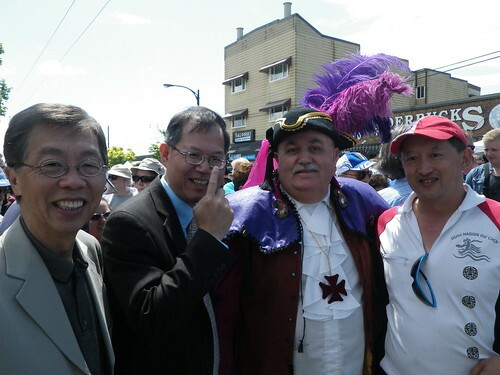 This entry was posted in Asian Canadian Cultural Events, Literary Events, Main Page, Vancouver Area Adventures, Visual Art and related events on September 26, 2011 by Todd. Joy Kogawa will give reading on Saltspring Island, and speak about how her childhood home was saved by The Land Conservancy of BC. I haven't been to Saltspring for a few years, and really looking forward to my trip this weekend. The event is organized by Maureen Moore, a big supporter of The Land Conservancy of BC. Also attending will be TLC executive director and founder Bill Turner, and TLC vice-chair, and cofounder Briony Penn. Briony lives on Saltspring, and I am looking forward to staying with her. She is an artist, author and conservationist, who once worked for the National Trust of Scotland, and had helped to set up “The Tam O'Shanter Experience” at the Robert Burns National Park – which I was able to see before it closed at the end of 2009. 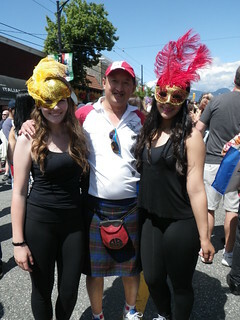 I will return to Vancouver early Sunday morning to coach the Gung Haggis dragon boat team – so my turnaround time will be a very relaxing and enthusiastic 17 hours on Saltspring Island. as a heritage site that is also functioning as a writers’ retreat. 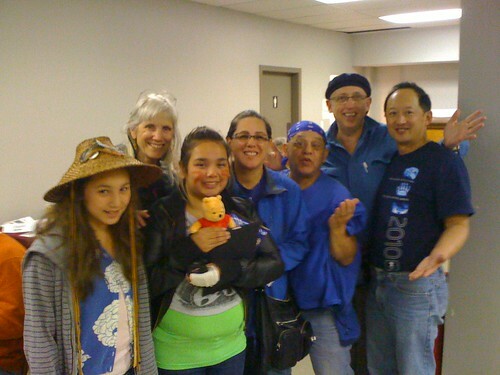 This entry was posted in Asian Canadian Cultural Events, Joy Kogawa & Kogawa House, Main Page, Vancouver Area Adventures on May 14, 2011 by Todd.